Background: Green chemistry is a discipline of great interest in medicinal chemistry. It involves all fields of chemistry and it is based on the principle to conduct chemical reactions protecting the environment at the same time, through the use of chemical procedures able to avoid pollution. In this context, water as solvent is a good choice because it is abundant, nontoxic, non-caustic, and non-combustible. Even if microwave assisted organic reactions in conventional solvents have quickly progressed, in the recent years medicinal chemists have focused their attention to processes deemed not dangerous for the environment, using nanotechnology and greener solvents as water. 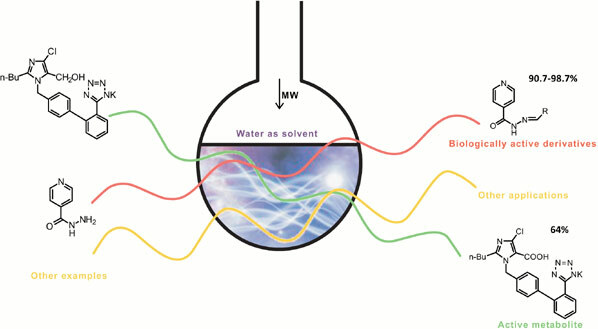 Objective: Several reports of reaction optimizations and selectivities, demonstrating the capability of microwave to allow the obtaining of increased yields have been recently published using water as solvent. In this review, we selected the available knowledge related to microwave assisted organic synthesis in aqueous medium, furnishing examples of the newest strategies to obtain useful scaffolds and novel derivatives for medicinal chemistry purposes. Conclusion: The intention of this review is to demonstrate the exclusive ability of MAOS in water as solvent or as co-solvent. For this purpose we report here the most representative applications of MAOS using water as solvent, focusing on medicinal chemistry processes leading to interesting nitrogen containing heterocycles with potential pharmaceutical applications. Dielectric heating, green chemistry, heterocycles, indoles, medicinal chemistry, microwave, nucleosides, purine bases, pyridines, pyrimidines, tetrazoles, triazoles, water. Dipartimento di Farmacia, University of Naples Federico II, Via D. Montesano 49, 80131, Naples, Italy.